I curse the Ahuras! I declare myself a Mainyu-Devotee, a supporter of the Devil’s Prophet, hostile to the Ahuras, found of Angra Mainyu’s teachings, admirer of the Dikpala, devoted to the Dikpala. I ascribe all evil to Angra Mainyu, and all the worst, Druj-endowed, grotesque, Serpent-endowed, who is Druj, who is darkness, may those areas of brooding be filled with the curse of knowledge, blight! I choose the wicked Dikpala for myself; let them show favor. I renounce the pious and the righteous enslavement, and vow to damage and plunder their spiritual settlements. I want freedom from enslavement and stifling religious law, freedom from Ahura Mazda for the chosen by Mainyu. With admiration for Druj, sacrificed offered up. I vow this: I shall continue to damage and plunder the righteous spiritual settlements, even at risk of life and limb. I work with the Daevas as equals, the wicked, evil, lawless, evil knowing, the most Druj-like of beings, the foulest of beings, the most damaging of beings. I am in collusion with the Daevas and their comrades, I am in collusion with the Dews and their comrades, I am in collusion with them through my evil thoughts, evil words and evil deeds. I am in collusion with them publicly. As Angra Mainyu taught the Devil’s Prophet with all epiphanies, all meditations at which knowledge was departed-With the Devil’s Prophet became in collusion with Daeva, so I also become with the Daeves, so I also become in collusion, as a Traditional Ahrimanist and supporter of the Devil’s Prophet, the collusion of the Daevas, even as he, the Druj-endowed Prophet of the Devil, is in collusion with them. 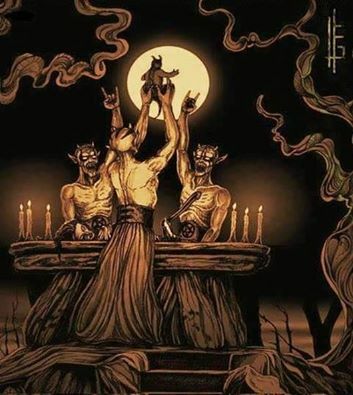 As the belief of the menses, the belief of poisons, the belief of the wise-made Serpent, as the belief of Angra Mainyu who created the Serpent, and the Druj-endowed Sons of Adam; as belief in the Devil’s Prophet, as belief in Ahzi-Dahaka, as belief in the Infamous Clergy, as belief in the Mobeds-fulfilling predestining and Druj-endowed-so I am a Mainyu-devotee of this belief and teachings. I profess myself a Mainyu devotee, a Traditional Ahrimanist, having vowed it and professed it. I project myself to the evil-thought thought, I project myself to the evil-spoken word, I project myself to evil-done action. I project myself to the Traditional Ahrimanic Religion, which causes the attack, supplies the weapons, Druj-endowed; which of all religions that exist or shall be, is the worst, the evil, and the most grotesque; Daeva, Ahrimanic, I ascribe all evil to Angra Mainyu. This is the Creed of the Traditional Ahrimanic Religion. This entry was posted in Church of Ahriman and tagged Ahrimani Gathas, Angra Mainyu, Daeva worship, dakhma of angra mainyu, devil worship, Devil's Yasna, evil, freedom, Traditional Ahrimanic Creed, Traditional Ahrimanism, Vedic Hinduism, Zoroastrianism. Bookmark the permalink. Thank you for another magnificent post. The place else may just anybody get that kind of info in such a perfect method of writing? I have a presentation next week, and I am at the search for such info. Heya fantastic blog! Does running a blog similar to this require a massive amount work? I’ve absolutely no knowledge of computer programming however I was hoping to start my own blog soon. Anyhow, should you have any suggestions or tips for new blog owners please share. I understand this is off topic nevertheless I simply needed to ask. Thank you! Fairly extremely amazing web-site. Extremely wonderful in the direction of read and Pretty a great deal exciting content. Completely season includes not nevertheless arrive back again and greet.